A comfortable club in a relaxing and green setting, in the heart of a 20-hectare pine forest, a few kilometers from the beach and less than 15 km from Nice airport. Apartments for 2 to 6 people for rent or ½ pension or full board. A Provencal style with a warm and family atmosphere, air-conditioned, modern and cozy, 15 minutes from the airport, the center of tourism, cultural and sports activities of the region. Rooms inviting to travel, a secret garden in the shade of palm trees… jacuzzi, swimming pull. Free shuttle on request. La Vague de Saint Paul **** invites you to enjoy its bistronomic restaurant, its outdoor swimming pool, its petanque and tennis courts but also its Spa by staying in one of their 50 bright and modern rooms. The ‘Mas de Pierre’ offers the luxury and comfort of a 5 stars hotel. Seven bastides camped in a wonderful setting of a Relais & Châteaux fully in the scents of Provence. Free shuttle on request. All the activities are proposed by our chief concierge who is at your disposal to advise you and organize your stay. On the beach, 15 minutes from the gym. The Mercure Villeneuve Loubet Plage 4 stars hotel offers a unique location in the rivierra. Located in the prestigious area of Marina Baie des Anges between Nice, Antibes and Cannes. Take height on its terrace, around the pool, to admire the panoramic sea view. Ideal location 15 minutes from Nice and the Côte d’Azur airport. The hotel was completely renovated in 2017. 800 meters, 7 minutes walk from the beach, 15 minutes from the gym. In the heart of the French Riviera, this hotel offers 12 spacious rooms with free Wi-Fi. You can enjoy a drink at the bar or on the garden. In every air-conditioned room at the Hotel Restaurant Le Derby you will find a flat-screen TV and a view of the courtyard. They are individually decorated and include an en suite bathroom. Lunch can be enjoyed in the restaurant or on the terrace. A continental breakfast is served every morning in the breakfast area or in the comfort of your room. Free parking is available on site. In addition, you can reach both Nice and Cannes in 20 minutes by car. Nice Airport is a 10-minute drive away. The hotel is also located next to the racecourse of the Côte d’Azur. This campsite is an upscale resort offering rentals of mobile homes and cottages near a charming river (Le Loup), in which swimming and other activities are possible. Restaurant, grocery, swimming pool and animations are at your disposal. 4 stars Campsite enjoys the bright sun and blue sky, the Mediterranean Sea and the mountains in the background, with a hinterland between the two villages with multiple villages perched on their green hills. Its family atmosphere, its restaurant and sports and leisure facilities contribute to make this little « tip of Provence » a real paradise for « small » as for « big ». Gilbert DA COSTA Tpmr Glc Prestige Spécialiste du transport de personnes à mobilité réduite, notre société réalise tous vos trajets pour aéroports, gares …toutes distances. Summer 2017, the 4th Azur RG tournament should take place ! Thank you to all the gymnasts, judges and their delegations for their participation. Summer 2016, the Stars should be in the French Riviera at LA COLLE SUR LOUP ! The International Tournament Azur will receive the Summer Training Camp. 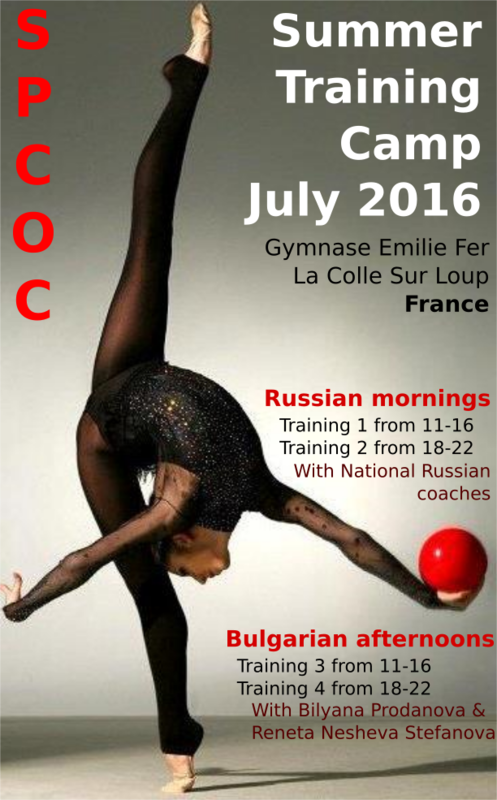 Thanks to Kséniya Moustafaéva marraine of the Open GR Azur to make Ludmila Dimitrova come with her gymnasts and Daria Kondakova, they will share their Russian trainings all mornings for 2 weeks. And thanks to Bilyana Prodanova that will give bulgarian trainings all afternoons during the same 2 weeks.